Zero Tolerance Knives have a reputation for excellence in everyday carry as well as tactical applications. Their craftsmanship, materials, and rigid standards are the yardstick many in the knife making industry are held to. This is why KnifeArt.com is proud to bring to you the Limited Edition 0450FCDAM Factory Custom, which will be available for sale starting on July 12, 2018. From knifemaking genius and creator of many of Zero Tolerance's line, Dmitry Sinkevich, comes the 0450FCDAM Factory Custom knife. The hardware and pocket clip on this knife is made by him, it provides a highly custom look and feel. 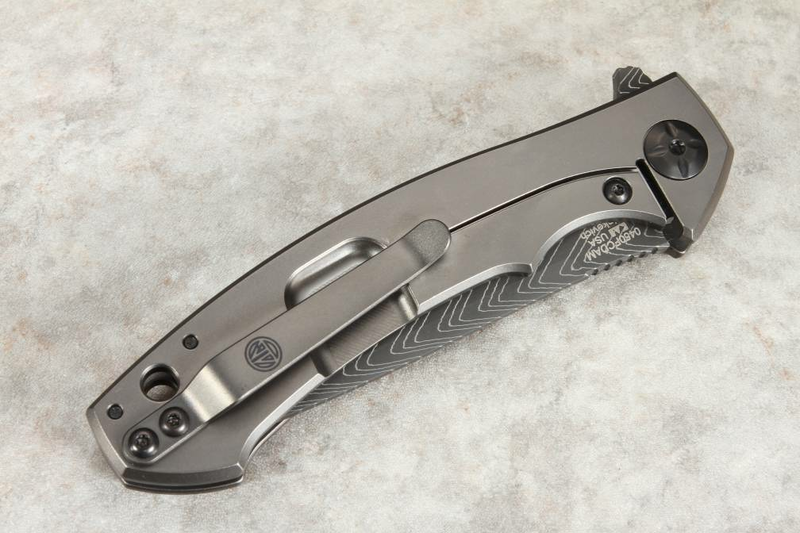 The pocket clip carries his logo, acknowledging the work he did on the knife. 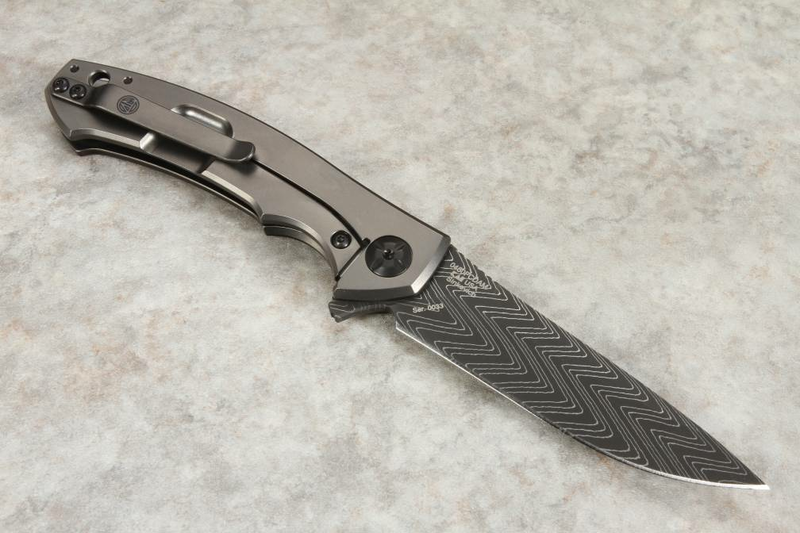 Then in collaboration with American blacksmith Devin Thomas, they are crafted with not only the utilitarian design and effectiveness Zero Tolerance is known for, but also the use of herringbone damascus steel for a striking look that will be as at home in a collector's display case as it is their front pocket. 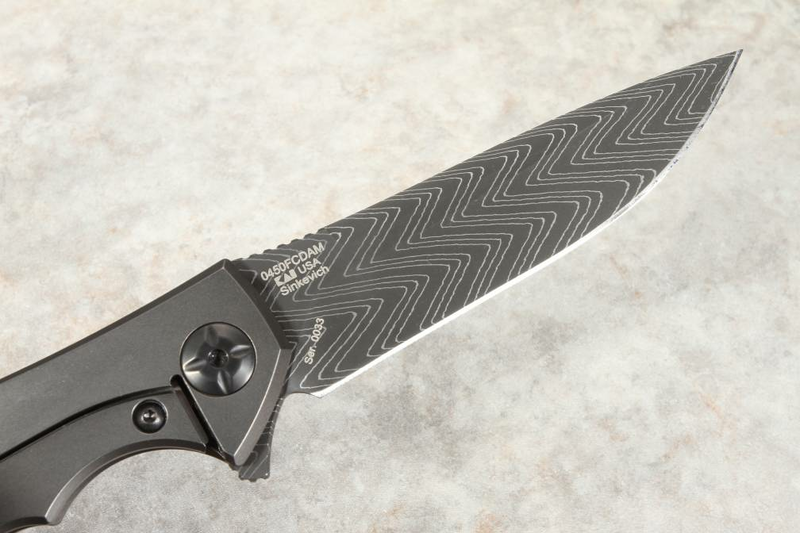 The 0450FCDAM Factory Custom knife is 4.1" when closed, but opens up to an overall length of 7.45". The 3.25" stainless damascus steel blade is created from a Devin Thomas herringbone pattern exclusively for this knife. The geometric pattern of the herringbone pattern contrasts extremely well with the machine pattern of the handle. 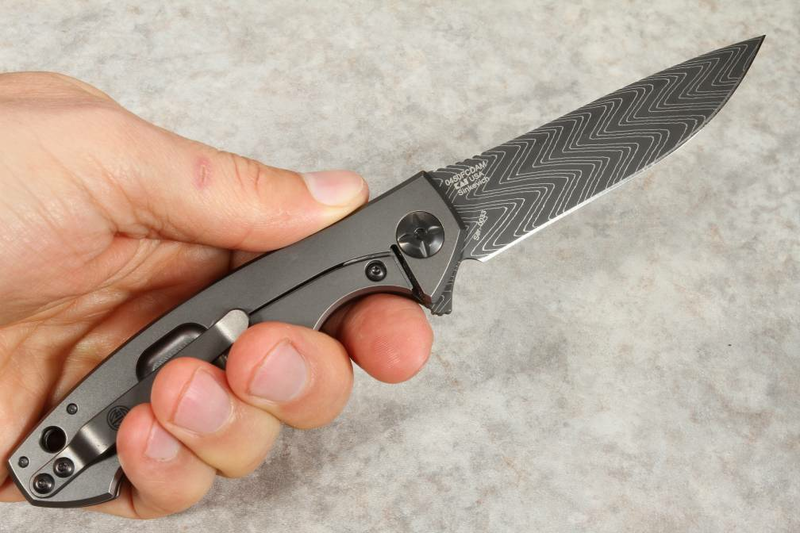 Jimping on the back of the blade allows for better precision work as well as a surer grip with the tougher jobs, this knife gives you enhanced materials and custom made parts on one of ZT's most popular, and EDC worthy models the 0450. 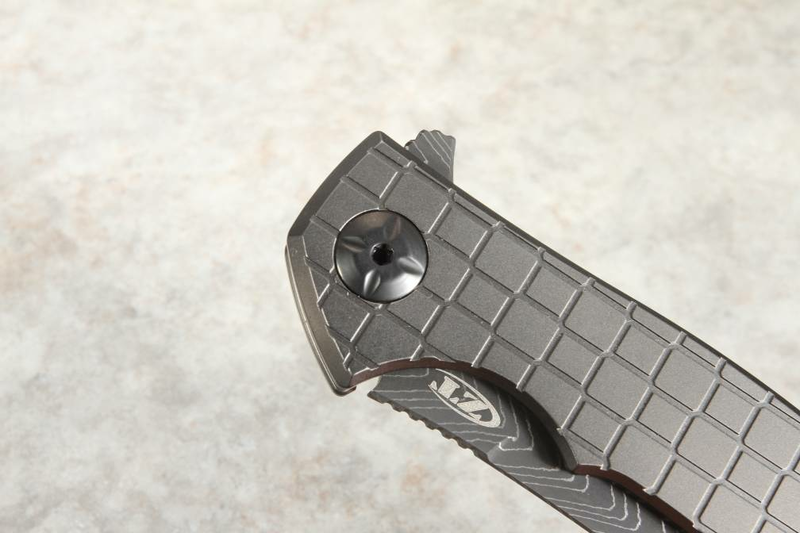 The KVT ball bearing pivot gives you quick and smooth opening with flipper deployment. 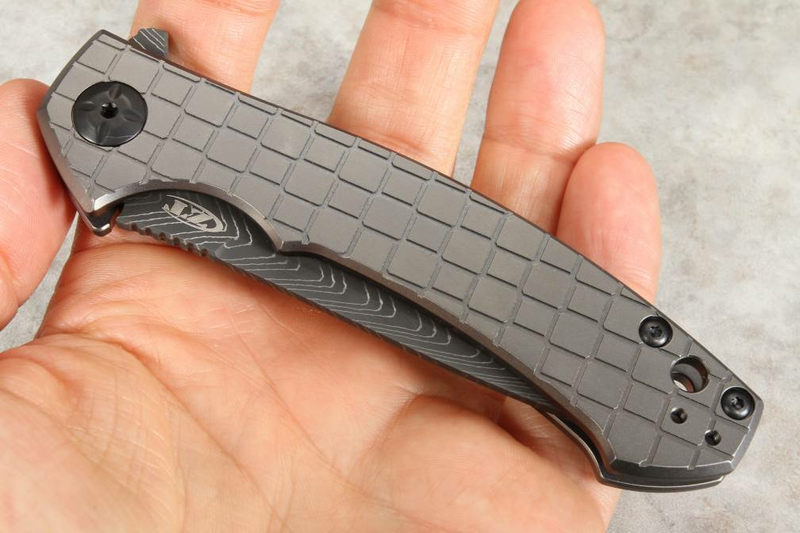 The titanium handle is gray PVD coated, featuring a machine patterned design of Dmitry Sinkevich's own creation. Finger grooves and the overall shape of the handle provide a comfortable grip that saves your hands as well as giving you optimum control when cutting, chopping, or piercing. The titanium frame lock with hardened steel lockbar reinforcement protects the mechanism from wear over time, providing you a safe and reliable locking mechanism that keeps the blade locked firmly in place during use. 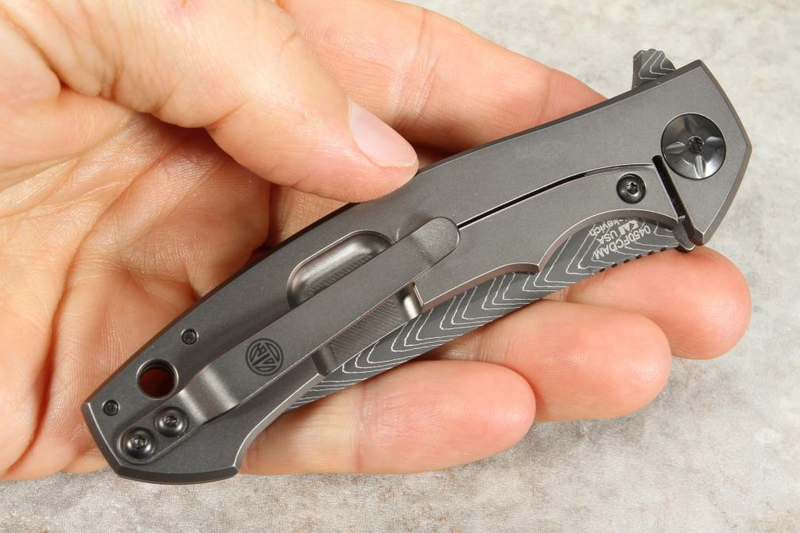 The titanium pocket clip allows for tip-up deep-carry in your pocket or on your belt. 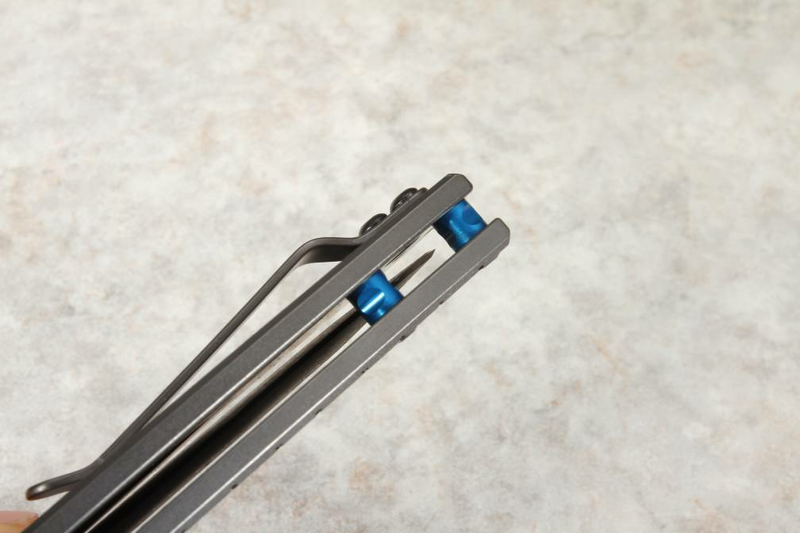 The anodized blue aluminum spacers finish off the aesthetic appeal of a knife that is not only a pleasure to use, but also a work of art in its own right. At $400 the quality and price of this custom designed and made knife just cannot be beaten. 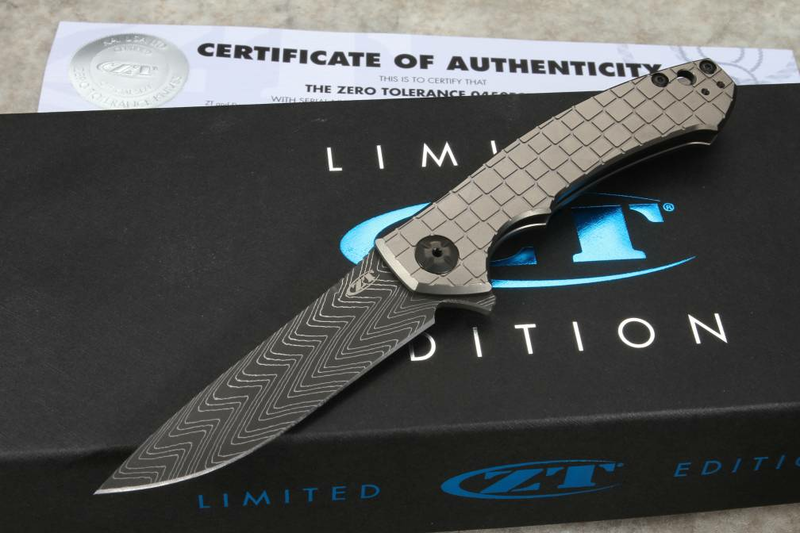 As an authorized dealer of Zero Tolerance knives, Knifeart.com is happy to give you fast free shipping and a customer satisfaction guarantee that if you don't love your blade, you can send it back and we will never charge you a restocking fee. Zero Tolerance knives have a reputation backed by a lifetime warranty on materials and craftsmanship. The sale of this knife is restricted to the USA and Canada. One knife purchase per household, please.